How to check Run-out on Tip? When you want to check Run-out of Tip of your Live Centre, please take it out from the Tail-stock of machine. Place taper shank of Centre properly on Magnetic ‘V’ Block. Rest such ‘V’ Block on C. I. Surface Plate. When you lock the ‘V’ Block, Centre rests firmly. Use either Lever Type or Plunger Type Dial having least count of 1 or 2 microns. Adjust Dial Stand such that round stylus of Dial rests on the front portion of Tip having 60° included angle. Do not measure run-out on any other portion of Tip. For checking run-out rotate Tip slowly by fingers. Subsequently if you wish to check Run-out on machine with Tip applied to component, you can. Apply dial on Tip as above. If you find it more than previous reading, you need to confirm proper fitting of MT taper shank in Tail-stock, alignment of Tail-stock axis with Head-stock axis, alignment of component axis with Head-stock axis defined by holding in soft jaws, etc. Please note, PRASHTECH Centres are designed such that difference between ‘no-load Run-out’ and ‘on-load Run-out’ is minimal. How to order special Tips? When you find your component cannot be supported using our Tips displayed here, you can enquire us about possibility of supplying Special Tips or Tailor-made Tips. Over past 19 years, we have produced many such Special Tips for variety of customers.We suggest you to download picture, take its print-out and draw a sketch of desired Tips. Please show only portion of Tip which is outside Centre on left hand side. If you send such sketch along with information like MT taper size of Centre and required quantity, we shall submit you our offer. Please note, we shall be manufacturing such Special Tip separately for you. Also note, we do not make any change in Housing. Premature failure of thrust bearing Excessive axial load causes premature failure of thrust ball bearing provided inside CENTRE. Use adequate hydraulic pressure or manual force to press Live Centre on centre hole of component. It should be just enough to prevent slippage between component and Tip. Vibration and chatter marks on components: Ensure direct fitting of taper shank of Live Centre into taper hole of tail-stock. Use of reduction socket may cause vibrations and chatter mark on components. Fast wear of Tip : Never apply grease to centre hole of component when you want to support it with Live Centre. Ensure adequate axial force to prevent slippage. Run-out more than specified : Either because a. Bearing life is over. b. Reground Tip is being used. c. Run-out is checked at wrong portion. If it is checked on portion of Tip other than its 60 degrees cone, like cylindrical portion or 15 degrees relief portion, it may be noticed to be more. Always check on 60 degrees cone. DO NOT lubricate CENTRE using any oil or grease. DO NOT hold housing in bench vice by mistake while replacing TIP. How to replace damaged bearings? Remove the Tip (Bullet) from Center as usual. All parts are to be removed from the front side. In case of MT5 Center the Cap is press-fitted. In case of MT3 & MT4 Centers instead of Cap, Rotating Labyrinth is provided. In either case, it gets ejected along with other parts by following procedure. Take a hardened rod of Dia. 7.5mm or less X 150mm long in case of MT4 & MT5. In case of MT3 it should be of Dia. 5.5mm or less X 100mm. Remove Seal Plug at the end of taper shank. Insert rod through a hole in the shank. Place end of this rod in the socket of the Draw Bolt inside. Hit the rod-using hammer while supporting the periphery of the Housing on the table. Thus entire sub-assly will come out of the Housing. This sub-assly consists, in this order – Cap or Labyrinth (Two parts), Cylindrical Roller Bearing, Pipe Spacer, Thrust Bearing, Disc Spacer, Wave Washer, Ball Bearing, Circlip (in certain models) and Draw Bolt at the rear end, all parts in line with Sleeve. One part of Labyrinth is press-fitted to Sleeve at its front end. Whereas other part was press-fitted into Housing. Separate outer part of Labyrinth. Then its inner part, Cylindrical Roller Bearing & Pipe Spacer will be free. Next remove the Ball Bearing by pushing Disc Spacer towards rear end of Sleeve with the help of hollow pipe. This will separate all the parts on outside diameter of Sleeve except rotating race of Thrust Bearing. Remove this race using another hollow pipe of suitable size. In MT5 Centre, Oil Seal is provided. Such Oil Seal is press-fitted in the Cap from inside face. Replace it if it is damaged. Clean all the parts thoroughly using cleaning agents. Replace all damaged parts & Bearings. Use KLUBER NBU 15 grease for lubrication. Assemble all the parts in original sequence and direction. Press-fit Labyrinth on Sleeve at the end. We recommend using such repaired Center for secondary machining operations on manual lathes. Always use new PRASHTECH Live Centers and fresh Tips for important operations on CNC as well as manual machines for total reliability and controlled run-out. Order spares according to ordering nos. mentioned in the following table. QTY per Center Ordering No. QTY per Center Ordering No. QTY per Center Ordering No. Why Carbide Tipped Centres are not recommended? When someone uses Dead Centre on grinding machine Carbide Tip is compulsory since there is a relative movement between component & Centre. Carbide has better wear properties. The component is also generally hard during grinding operation. Hence its centre hole does not get damaged because of carbide. Whereas during turning operation Live Centres TIP is continuously rotating along with component. There is no relative movement. Components are generally soft. Hence according to our observations it is not advisable to use Carbide. Further PRASHTECH has developed this concept of TIP replacement for the same purpose. In case of PRASHTECH one is able to change damaged TIP at very low cost. PRASHTECH Tips are through hardened to 60-63 HRC value. Hence even against harder components those won’t wear so fast. We do not manufacture any Live Centres with Carbide Tips. You need to fit Pipe Tip to PRASHTECH Live Centre to support hollow component. We make different Pipe Tips to cover complete range of bore up to 96 mm. Following table shows such Pipe Tips suitable for MT3, MT4 & MT5. For supporting components having bore more than 96 mm please use Centre fitted with Standard Tip along with Mandrel. We recommend that Mandrel should be hardened. Its locating diameter which supports bore should be ground with reference of Center Hole on its face. How PRASHTECH Tip holding mechanism is superior than competitors? This mechanism incorporates Draw Bolt that secures any PRASHTECH TIP into corresponding SLEEVE. Shank of Tip and SLEEVE are both precisely taper ground for maximum contact area with total interchangeability for future use of spare PRASHTECH TIPS. The preloading of Bolt enhances stiffness of the arrangement, thus reduces ‘On-load’ deflections and hence one gets controlled ‘On-load’ run-out (TIR). This mechanism employs threads at the end of shank of TIP for fitting. Preloading is not achieved. Short engagement length compared to TIP overhang and absence of preloading may lead to excessive tip deflections and hence higher ‘On-load’ run-out (TIR). In such mechanisms TIR is guaranteed only for those TIPS, which are ground on Center. Interchangeability does not guarantee TIR. In this mechanism, spare TIP has a taper shank of self-locking type. TIP gets locked inside taper ground bore of SLEEVE just by insertion. TIP retention is due to frictional forces between the two surfaces. 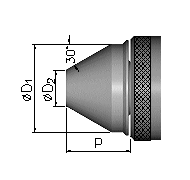 Here, because of smaller gauge plane diameter of TIP’s taper shank, load carrying capacity of the unit is much less. With such mechanism TIR specified by manufacturer is not as close as PRASHTECH. To summarize, both Competitors’ mechanisms permit use of such Centers for Tool Room type applications only, where versatility takes precedence over very high load conditions. Whereas PRASHTECH Centers having TIP replacement facility are designed with above shown mechanism for versatility combined with much higher load carrying capacities. Hence PRASHTECH Centers are compatible to CNC machines’ operating parameters. Source: Published data and product literature. All Live Centres and Tips are assigned one unique number for trace ability. All types of Tips are totally interchangeable among same size of Live Centres. If any time worn Tips are reground by user, accuracy of regrinding will decide end result. Such Tips should be thoroughly cleaned and little grease should be applied to their internal threads, before fitting them to Live Centres. For best results always use Prashtech Tips.